Running away from his failures in trying to compete with professional baseball stars, fifteen-year-old Alejandro Lòpez winds up destitute in a seaside city in western Mexico. Although the runaway Cuban attempts to conceal his abilities on the diamond several members of a ragtag semi-pro team—the San Arturo Zancudos—drag him back into playing the sport he loves. An instant success, both on the field and with the town’s teenaged flirts he sparks the formerly last-place has-beens into a contender for the league championship. Will Alejandro’s skills lead him to a brighter future? To find out a little more of his journey, I’ve been joined by Robert Joe Stout author of ‘Running Out the Hurt’ today. Robert, what inspired you to write this baseball novel? Readers of the poetry chapbook “They Still Baseball the Old Way” encouraged me to amplify the portraits into an action-filled, fun-filled novel. How did you use events from your own life to amplify this novel? I played fast pitch softball for many years and as a freelance journalist covered major league spring training. I’ve been a baseball fan all of my life. Did the characters like Alejandro, come out of experiences in the baseball world? They came to me out of experiences playing the sport and from living in Mexico and sharing a working-class, sports minded life with some very wonderful people. What did you find was the greatest reward from taking these experiences of sport and people you’ve met through sport and turning it into ‘Running Out the Hurt’? Sharing baseball, fun, love, disappointments, achievements with the characters. I can see how sharing all of those things would be greatly rewarding. When you look over each of these elements, is there a single point that jumps out at you as the most important takeaway that you hope readers take from the highs, lows and love of baseball? Human relationships are important, especially those formed around an activity, a sharing, comradeship, the melding together of disparate personalities seeking a common goal. What have you learnt from documenting this fictional tale of working together to solve a common goal? It’s not winning that’s important, it’s it’s being who you are and sharing that who-you-are with others. How are you continuing to share who you are with your writing? What’s next for you? I’m completing two nonfiction books about Mexico, one concerning teacher protests and their violent repression in Oaxaca, the other updated sequels to the immigration and war on drugs chapters of Hidden Dangers, which was published in 2015. What is it about writing that keeps drawing you back to create both new non-fiction works, and others that follow up from what you’ve previously written? As writing is so integral to you, I’m curious to find out how you approach writing. For example, how does a new book unfold for you? Is the destination planned, or do you find it as you continue to write? With fiction I know what I want to achieve but develop the characters and how they react to situations as I proceed. With nonfiction, I have much of the information at hand and add to it with research as I develop the themes. How do you use editing to reach what you set out to achieve? I edit as I write. My self-published books first appeared with commercial presses and went out of date. All of my books, including the two volumes of poetry, have been edited by publishing company editors. You’ve worked with commercial presses and publishing company editors, so I’m keen to find out how you feel that your author voice has progressed over time and after feedback. How do you feel it has changed? It’s not something that I’ve thought about or tried to track. My writing reflects my intellectual and emotional growth but isn’t separate from it. Has this intellectual and emotional growth led you to consider your work through the lens of an author brand? I have an author identity as a journalist and a separate participation and identity as a poet. I put myself into my work but haven’t felt a need to create a persona different from who I am. As you’ve kept that same identity, I’m quite interested to know what you think about when you write. What’s usually on your mind? Basically to be honest, interesting and accurate. Using a little of that accurate honesty, can you share what you feel is the best steps authors can take to improve? Professional athletes spend most of their time in practicing, hour after hour, day after day, year after year. Writers need to do the same. While writers continue to practice their craft year after year they will no doubt turn to publishing their work. What advice do you have for those looking to self-publish? Be sure of your goals. Most self-published books earn less than one would sacking groceries at Walmart. As a writer who is sure of their goals, I’d love to know what word sticks in your mind and your heart as your favourite? To life! Before you return to your life today, can you share a line from ‘Running Out the Hurt’ to those who are inspired by life? A different view on life that I expected, but one that still needs to be explored. Robert, thanks for chatting baseball and writing with me today and I hope to watch your love of both of these grow in the future. Excited to read the book we discussed today? Find it here on Amazon: ‘Running Out the Hurt ( ASIN: B00KWISS72 )‘. 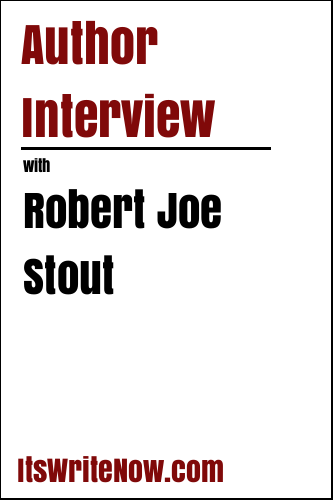 Want to find out more about Robert Joe Stout? Connect here!